· 1st Class Certificate of Competency preferably with Bachelor’s Master’s Degree in Engineering / Engineering Management. · Minimum 3 years experience as Chief Engineer on Tankers / Bulk Carriers. · Experience as Superintendent Engineer would be preferred , Must be conversant with Computerized Planned Maintenance System. The Company operates large number of Tankers (both Crude and product vessels) as well as LPG carriers. Tanker/LPG experience is mandatory for all deck positions. Age limit for Chief engineer and Master is 55 years and for all other positions 45 yeas. These requirements are for a highly reputed government owned shipping company, which offers excellent remuneration and other terms of employment. Only those candidates should apply who are in possession of all valid required certifications and ready to join within short time. The Hasham Group is looking for a hard working and dedicated logistic officer for their warehousing facilities situated in SITE and landhi. Responsibilities will include leasing and maintenance of Warehouses and liaison with all tenants. The candidate should be a graduate and well versed in this field. SGS a leading multinational inspection, Testing & Certification Company requires the services of compliance Auditors for its Karachi and Lahore Offices. Candidates should preferably be Textile Graduates & Certified Lead Auditors in ISO 9001, 2008 ISO 14000 & SA 8000, Experience in Textile Fabric, Apparels, Home Textiles, Sports Goods, Leather, Footwear and Food is preferred. Assistant Administrator, Corporate Services Office, based in Karachi. Education & Experience: Bachelors degree and minimum 3 years work experience are essential. Soorty Textile is the most aggressively growing vertical textile concern in Pakistan with operations and exports spread across the globe covering all procedures from cotton to carton packed garments. BE or DAE electrical or Mechanical with minimum 8 to 10 years experience of managing medium size service department preferably of diesel generating sets, with sound knowledge of engine, alternator, ATS Panels, fault rectification, installation and commissioning. Must be mature and computer literate. Scilife Strongly believes that its is the people that are the company’s most precious assets. Their energy. Enthusiasm and productivity will translate into the dynamic growth of Scilife. Scilife believes in working with passion & commitment to deliver results and to create best opportunities for employees to grow and progress in a culture of meritocracy. We know that Meezan Bank had been offering financing facilities for laptops to businesses and individuals, and this deal just got better for those who seek laptops at monthly installments. Meezan has partnered with Intel Pakistan to offer one-stop Shariah-compliant financing for consumers who purchase Hewlett-Packard laptop computers based on Intel® 2ndgeneration Core processors through Meezan Bank's Laptop Financing Scheme. Features of the Laptop Financing Scheme include fixed payment installments over three to 24 months and a two-years warranty, including parts provided by New Horizon and free Takaful (Islamic insurance) cover for damage and theft of laptop. Additionally, dedicated after-sales service will also be provided by New Horizon. Easy Installment options for financing period for 3 to 24 months. 2 years warranty with parts provided by vendor. Free Carrying Case will be provided by vendor. 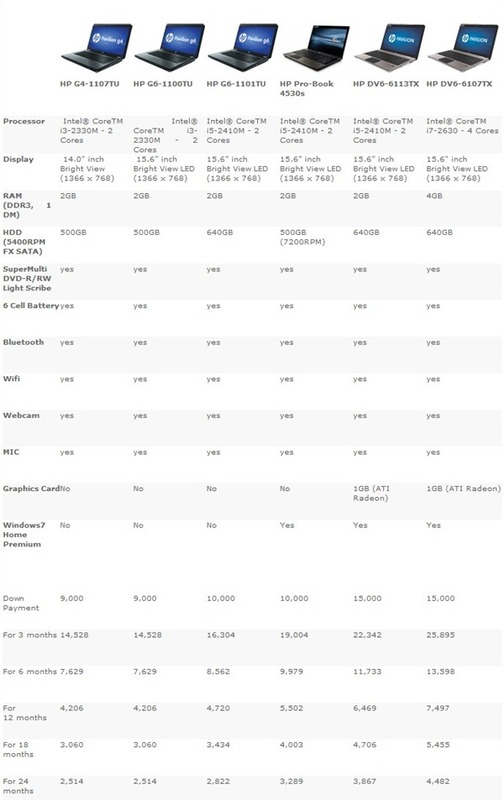 Laptop model offerings will vary from time to time in consistence with the latest & upgraded features and market demand. Clocked at 800 MHz HTC Salsa comes with 3.4-inch touch screen. With sizeable RAM of 512 MB, HTC Salsa is powered by HTC Sense. In addition to 5 Megapixel camera with auto focus and flash there's a VGA front Camera for video calling as well. Its anodized aluminum body and state of the art design makes this device very nice to have and to hold. Ufone says that HTC Salsa is available for it's postpaid customers at Rs. 29,999. 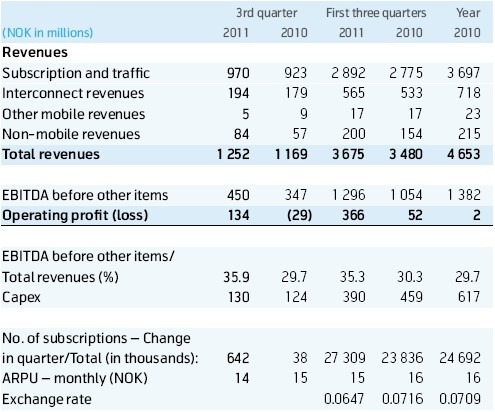 Telenor Pakistan has posted total (mobile and non mobile) revenues of PKR 19.8 billion (NOK 1,252 million) in Q3 for fiscal year 2011, up from PKR 16.2 billion (NOK 1,169 million) a year ago during the same period – showing a whopping 22 percent increase in total revenues. In it's group financial statement, Telenor said that it's Pakistani arm added 642,000 customers during the quarter and the subscription base was 15% higher than at the end of third quarter last year. increased gross margin and improved opex to sales ratio partly offset by increased energy costs. EBITDA in local currency increased by 47%. ARPU in local currency increased by 5%, resulting from increased usage, partly offset by decrease in seasonal activity during Ramadan and the flooding in the South region. Telenor said that capital expenditure continued to be focused on network capacity investments to align with current subscription growth and traffic volumes. Each Telenor Pakistan customer, according to report, consumed 197 voice call minutes on average per month, while the Average Revenue Per User (ARPU) for prepaid stood at Rs. 221 for prepaid and Rs. 737 for postpaid customers during the reported period. Telenor Pakistan, the country's second largest cellular company, continued to perform well in the third quarter of 2011 according to the latest figures released by the Telenor Group. It added 642,000 subscriptions during July-September, ending with 27.3 million subscribers. Number of subscribers grew 15% over the same period last year; market share remained stable at 24%. CEO Telenor Pakistan Christian Albech, speaking about the third quarter figures, said: "Telenor Pakistan continues to grow at a sustainable pace. In Q3 we solidified our position as Pakistan's second largest mobile operator by crossing 27 million subscribers. We also continued with planned investments in Pakistan, a testament of which was our winning the Prime Minister of Pakistan Trophy for Largest Foreign Direct Investment, an achievement we are proud of." A highlight of the reporting period was Telenor Pakistan and Tameer Bank's Easypaisa services which added three new corporate accounts to its portfolio. Customers to these websites can now pay for goods via Easypaisa: Homeshopping.pk, Pakistan's largest online retail store; Intellect Wealth Associates, an eLearning website that helps students prepare for their Board exams; and I Dress, a platform which lets women design their clothes online. Rozee.PK today announced that it will assist the Higher Education Commission of Pakistan on a ranking of Pakistani universities. The final list of ranked universities will be used to gauge the status of higher education in Pakistan and to recommend improvements for higher educational institutions, said a statement issued by Rozee. One of the criteria in ranking that the HEC considers is post-commencement employability. With over a quarter of Pakistan's online population visiting the site annually, and over 2.2 million registered professionals and over 40,000 employers posting available jobs, ROZEE.PK is sharing the relevant information, specifically employment within the various sectors with HEC free of cost. This data will be used by HEC to gain a comprehensive picture of the state of higher education and to rank the Pakistani universities accordingly. "As Pakistan's most powerful talent matching platform, ROZEE.PK has access to data spanning millions of records. We strongly believe in the importance of higher education in helping secure better employment opportunities and are happy to help a national institution like HEC on a project of such national significance,"
"We at the HEC aim to bring Pakistan's universities at par with international standards. The HEC is striving to build capacity of HEIs to contribute effectively in national development as well as to get reflection internationally for competitive Higher Education standards. The recent advancements towards practicing a national system of quantitative ranking of HEIs based on QS world ranking is one of such measures. We are grateful to ROZEE.PK for facilitating HEC in gathering this critical data of graduate employability seems essential for the purpose". 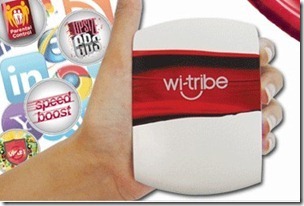 wi-tribe has come up with a power solution for those who are usually on the go with their laptop and tablets and those who want to have powerful internet connection beyond their base environment. 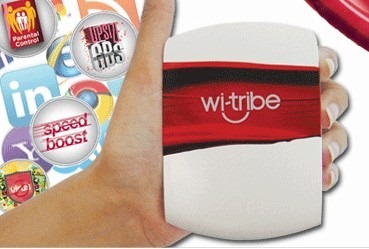 Just before the anticipated launch of Wateen's new device, wi-tribe has unveiled it's new Pocket Modem that will enable you to enjoy an added amount of convenience with a more powerful, yet portable device that will keep you connected. With this newly introduced Pocket Modem, you can not only access broadband on-the-go but you also get to enjoy an exclusive new package. Download speeds will be reduced upon utilizing 30GB on 512Kbps endless package in any given month. The Pocket Modem is currently available at all customer care centers and select retail partner locations in Karachi, Lahore, Rawalpindi and Islamabad. wi-tribe Introduces Endless Downloads, Sort of! Taking a step forward to promote environmentally sustainable initiatives, Ufone in collaboration with AIESEC successfully carried out an internationally acclaimed project in Pakistan. The project named ‘My World My Choice’ has been successfully running under the AIESEC umbrella in Canada and India and this is the first time AIESEC in association with Ufone has brought this initiative to Pakistan. AIESEC is the world’s largest youth-run organization and is present in over 110 countries and territories and with over 60,000 members. Focused on providing a platform for youth leadership development, AIESEC offers young people the opportunity to be global citizens, to change the world, and to get experience and skills that matter today. The members of the Ufone Volunteer Group (UVG) along with AIESEC representatives visited various middle schools where the UVG's being mentors, imparted knowledge and indulged in various simulation activities. The project aims to cause a direct impact, working with the children in question to bring a positive change in their lives. This program provides middle and high school students in Lahore the ability to become future leaders in sustainability. Akbar Khan, Chief Marketing Officer at Ufone said that through such mentor-run classroom presentations, sustainability leadership simulations, and innovative design projects, we enable the leaders of tomorrow to become responsible citizens and empower them with the tools for sustainable decision making and inspiring them into action. The members of the Ufone Volunteer Group expressed their desire to work under such international initiatives in the future claiming that only by educating and guiding the next generation of responsible citizens will they be able to witness a positive change in the social environment of the country.